Methi (Fresh Fenugreek Leaves) has always been my favorite greens. I remember my mon making Methi Bhaji ( with aloo/potatoes)) and Chapaties for breakfast as default, whenever I returned from college/hostel or even when visited home from England. Having to face a choice to choose between Methi Bhaji and anything else, be it Chicken or Mutton, I would choose the former… anyday! 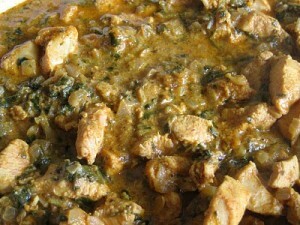 Also, You could replace the chicken with Mutton , If you wish to make “Methi Mutton”. But remember to pressure cook you mutton before adding it into the Curry. Please check the ingredients; something just is not right…..